Every brunch menu should include a simple one-dish recipe. 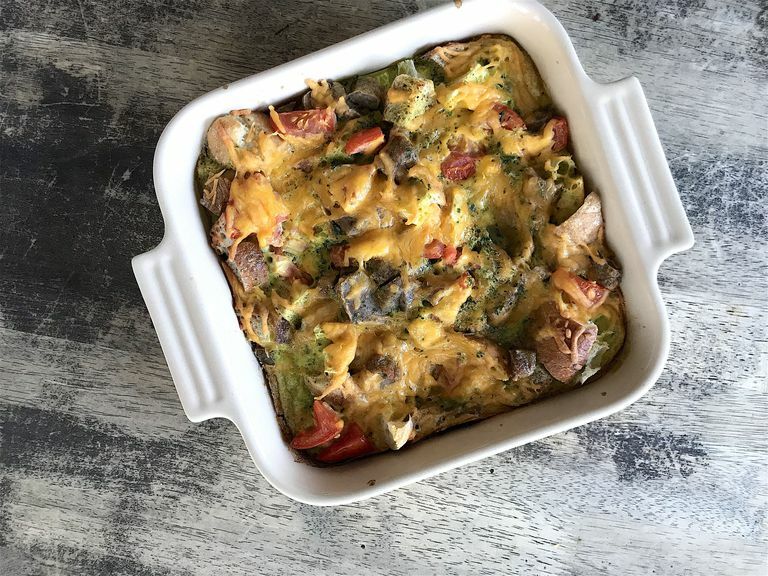 This breakfast casserole is made with eggs, chicken sausage, cheese, and fresh tomato to create a hearty, protein-rich, healthy breakfast. Assemble the ingredients ahead of time and bake just before company arrives or the family gets up to start their day. Leftovers are perfect for a brown bag lunch. Spray a 9x9 square baking dish with nonstick spray. Toast slices of bread. Once cool enough to handle dice into large pieces. If sausage is frozen, thaw in the microwave or skillet according to package directions and then roughly chop. Evenly distribute bread and sausage in the bottom of the prepared baking dish and set aside. Combine eggs, half and half, and basil to blender; season with salt and pepper. Pour egg mixture into prepared dish. Sprinkle with cheese and tomato. Carefully place in the oven and bake for 20 to 25 minutes or until eggs are set. Remove from the oven and allow to cool for at least 15 minutes before serving. Replace basil with any fresh green herb such as parsley, chives, or tarragon. Swiss cheese and broccoli are just as delicious as cheddar and tomato. Do your best to stick to the cup of cheese to keep the fat and calories in check. To see if the eggs are cooked, press down gently on the top of the casserole and make sure no liquid egg runs out. If the top of the casserole begins to look too brown before the eggs are cooked through, cover the casserole loosely with aluminum foil for the remainder of cook time.